[FINISHED] 60,000,000,000th Bet Giveaway! 60+ ZEC Prize Pool! 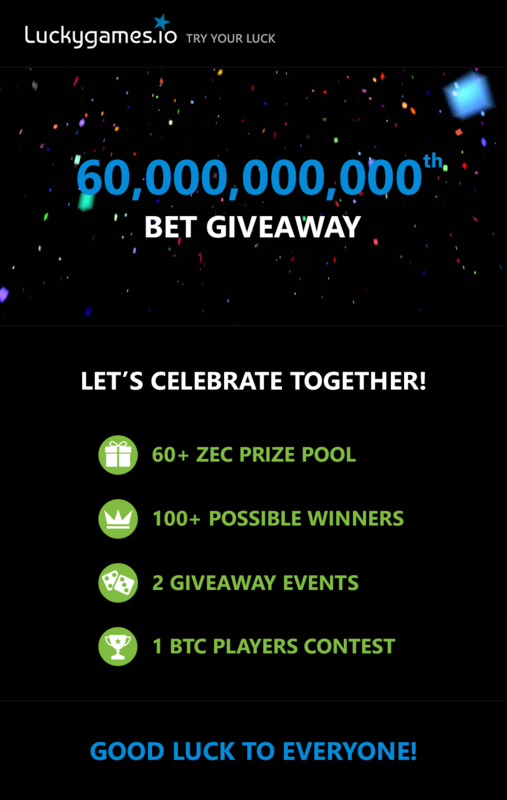 We are about to hit the next milestone of 60 Billions bets and we want to celebrate this great event by inviting all of you to join our 60+ ZEC Giveaway with 2 Events and 1 BTC Wagering Contest. You need to hit the bet ids given below. Each winner takes 0.6 ZEC and 6 Days VIP (Total 100 Winners). Zcash (ZEC) can be used only to place bets. Minimum bet amount - 0.0001 ZEC. Each player can score only ONCE. Multi-accounts are prohibited. Multi-tabs / more than 1 session or JS bots are not allowed. Next bet id will be taken, if current bet or account not pass the requirements. 60,000,000,000, 60,000,000,001 and 60,000,000,002 bets. If you hit 1 roll number, you win 0.3 ZEC and 3 DAYS VIP! If you hit 2 roll numbers, you win 0.6 ZEC and 6 DAYS VIP! If you hit 3 roll numbers, you win 0.9 ZEC and 9 DAYS VIP! Post your prediction numbers in the comments bellow using this format. Each player can submit prediction only ONCE. Multi-accounts are prohibited. If we find that you used multi-accounts to post different predictions, you will be disqualified. Next bet id will be taken, in case of 2 same roll numbers. Players (Wagering) Contest with 1 BTC Prize Pool will be held on the next day since we hit the 60th billion bet at 00:00 UTC (server time). Follow the Contests page! It will be a good contest.